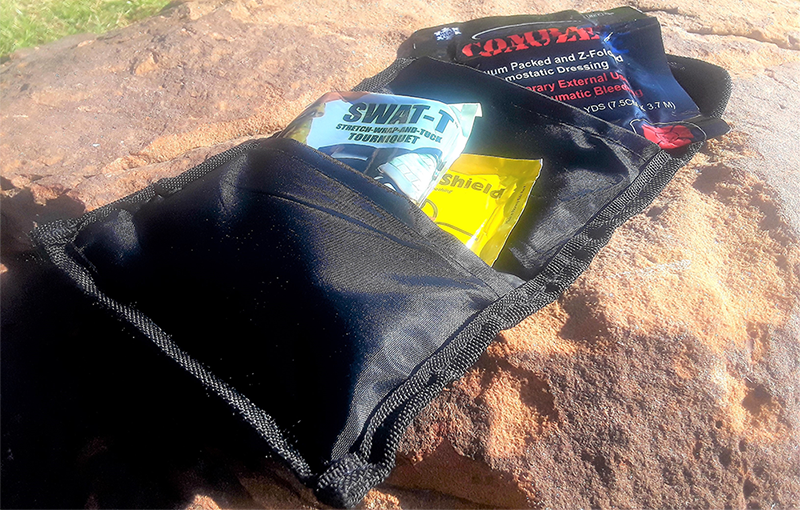 If you’re carrying a firearm, your EDC should also include a trauma kit. It doesn’t matter how big or what type. It needs to be with you. 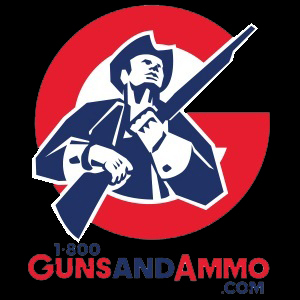 Statistically, you are more likely to face a medical emergency than a gunfight. Having a medical kit on your person can be invaluable for use on yourself or another individual. My approach to medical gear is the same as to guns; the only medical gear that counts during crisis is what you have on your person. If someone is bleeding to death and your tourniquet is 200 yards away in your car, those seconds are counting. We wouldn’t consider ourselves ready for a gunfight if our gun was in the car, why then would we consider ourselves to be ready to deal with the effects of a gunfight if our trauma kit is in the car? 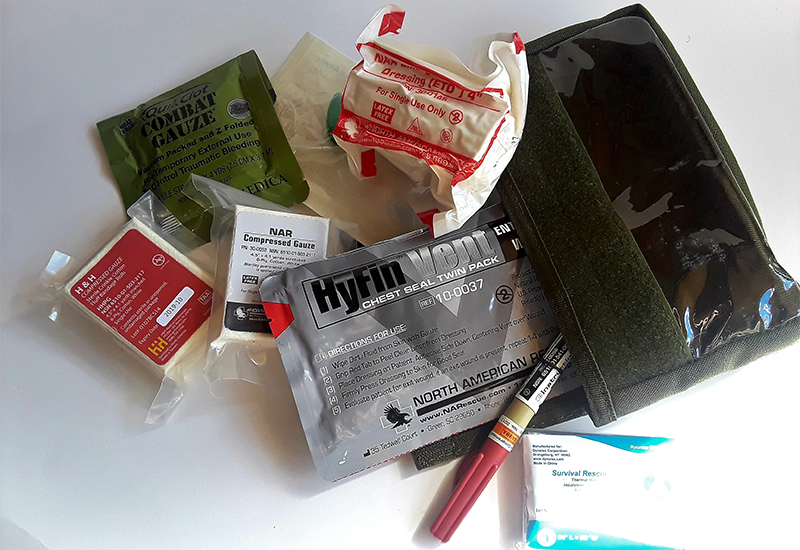 Medical kits provide the individual law enforcement officer or concerned citizen with the necessary equipment to immediately treat life-threatening injuries. Trauma kits are meant to deal with major injuries until medical care can be reached. Having a first aid kit filled with bandages is fine for a trip to the park, but having a trauma kit is for more serious situations. 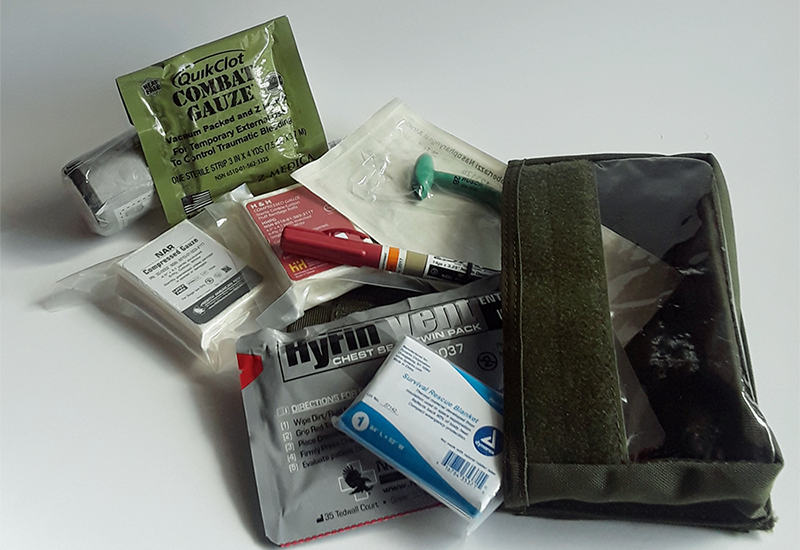 Medical kit, trauma kit, or survivalist kit- it’s all the same no matter what you call it. There’s a difference between having your medical kit NEAR you and WITH you. This can make a difference in how quickly and effectively you can render aid to someone whose life is on the line. You can have one in your car or at home, but you may have to get into the habit of carrying one on you. Whether it’s in your daypack, purse, or even in your back pocket, make sure it’s accessible to you. Even if you carry a tourniquet, it’s still better than nothing. Over the years, I’ve been in the habit of always having some form of a trauma kit ON me. Even if it just has three items in it, it’s better than having nothing at all. It’s better to have it and not need it than to need it but not have it. Hundreds of people are treated for injuries related from outdoor activities such as fractures, sprains, lacerations, concussions, burns, and so on. With your trauma kit, you can do something about it. You’re not going to fix a broken leg in the field but you can make the long ride to the hospital much more comfortable and reduce the chances of furthering the injury. However, owning the gear doesn’t magically give you the knowledge of how to use it. Just as all your EDC gear, you’ll need proper training on how to use the supplies. The equipment in the kit is only as good as the training of the user. Your training dictates what you carry, along with your proficiency and confidence in using those tools when the time is needed. If you can’t handle needles, then maybe it’s not the best idea to carry a decompression needle in your trauma bag. 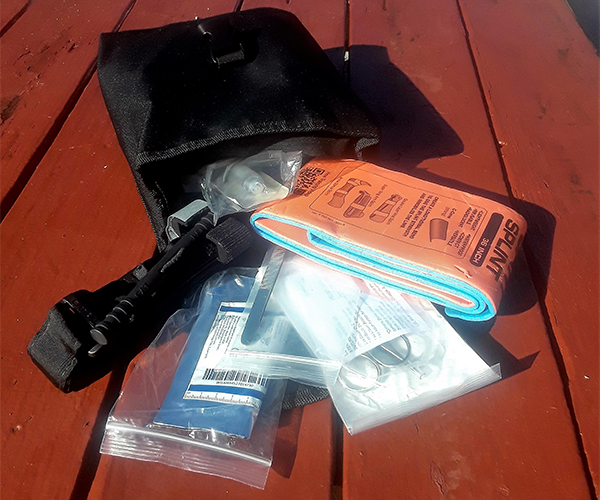 Some kits contain items such as decompression needles, airway adjuncts, IV equipment, and suturing supplies. Carry what you are comfortable with. Medicine is always evolving as research is conducted and new items come onto the market. When carrying your survival kit, make sure all your items are up to date. Some medical items are known to have expiration dates. Be sure to always keep an eye on your supplies and regularly change them out when needed. 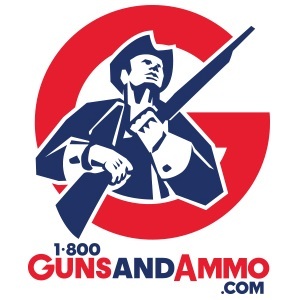 Spend some time researching your supplies and the companies you purchase from. Most companies sell quality medical kits and supplies while others have lower end items for the same price. Trauma kits have fewer items than a first aid kit, but the items need to be packed in a way that makes them easy to find in an emergency. Typically you’ll find that a medical pouch, once opened, reads like a book from left to right, top to bottom. I recommend all your medical supplies need to be labeled and organized to help with confusion when the moments count. One of the great reasons to build your own kit is you can fit it to your needs. Anything you want or need can go into your custom kit. It’s tailored to you or a family member. For example, if you or a loved one has a certain allergy, diabetes, or a medical condition, you are building your medical kit just for you. Also, you are able to spend what you want. You also have the power to choose the brands you specifically want or prefer. Purchasing pre-made medical kits can be pricey. Most medical supplies only come in bulk. For example, you may only find a box of 100 count nitrile gloves or a box of 20 count decompression needles. However, buying in bulk allows you to have multiple items to build several kits, and it’s a cheaper option. For example, if I were to purchase a trauma kit from ITStactical, what am I really getting for the price I paid? (This doesn’t include shipping). The ETA Trauma kit is a good start but it doesn’t have all the items I need. If I wanted to add extra items to my ETA Trauma kit then I’ll be paying additional money. So I went on Amazon and found the same items and was able to build the same kit but at a much cheaper price. I was able to also get the brands I prefer. If I wanted to complete my kit with all the things I want, I would still be under my budget. And, as you noticed, some of my items only came in bulk so I have extra supplies to start on another kit. It didn’t take as much of time as I thought it would to compile it all. When you want a certain product from a company, it may take some time for it to deliver to you. Some companies can deliver in a matter of days while others can take weeks. Your kit may not be complete while you’re waiting for certain items. Also, research takes time. Looking for the right price without losing quality is time consuming. Plus, you may have to pay shipping for each individual item. These are factors to consider when building your own kit. When purchasing your medical kit, it’s quick and straight-forward. You’re not looking for each item separately. It’s a one-stop-shop like this one from North American Rescue. Normally, pre-made trauma kits come with everything you need for an emergency. Sometimes, it can be cheaper purchasing a simple kit you need. 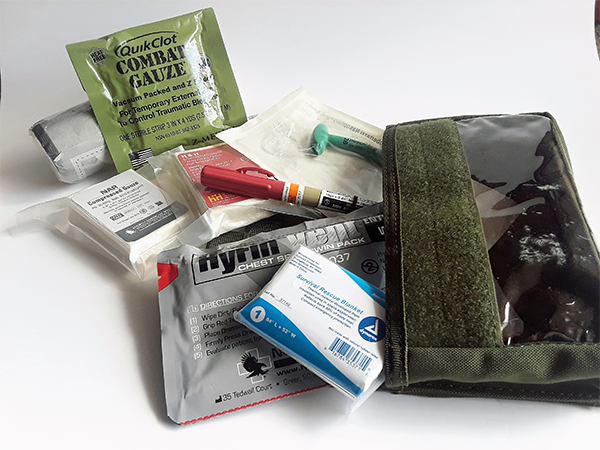 Buying a ready-made kit is a great way to introduce someone to the importance of having a trauma kit. Basic kits are made to offer the essentials, and they are a good place to start. You get a well-rounded assortment of products and then build up with additional items over time. 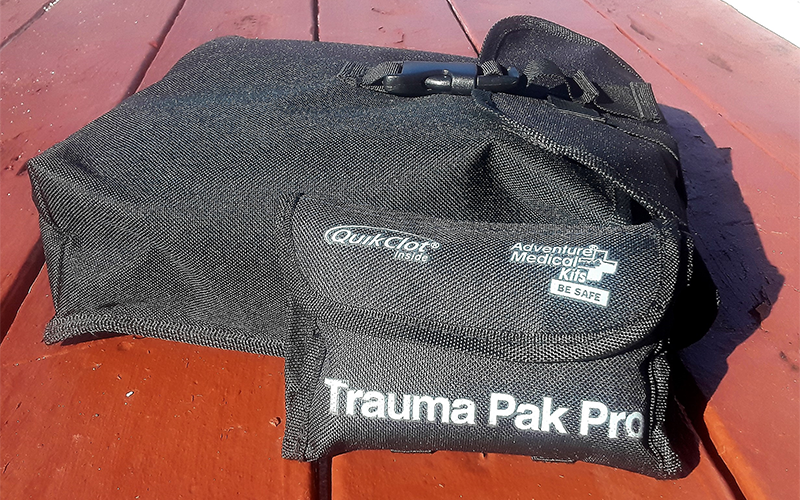 The quality of products in trauma kits varies drastically from company to company. Also, it depends what kind of medical kit you’re looking at. Cost and value differ from kit to kit. A cheap kit with the bells and whistles might be enough for a one-time emergency, but will it hold up over time? Also, “kit-ing” can enable companies to charge more than a kit is worth because it seems like you’re getting a great deal. Most trauma kits are a one-size-fits-all, but it also takes away the uniqueness of a custom kit. Also beware, first aid kits are normally packed with bandages and low end supplies. A simple first aid kit is ideal for treating a scrap but you can’t address real injuries during an emergency. Also, many inexpensive kits include pocket knives or multi-tools often cheaply made or off brand items that will falter under duress. Each trauma kit has strengths and weakness. Advanced first aid kits can be good for beginners, but even then it’s best to learn by researching products for yourself. That experience provides insight into your own preferences and needs, and already-made kits tend to take that process away from consumers. It’s also important to evaluate what items you need. I recommend carrying different levels, perhaps one in your everyday purse or bag, a large first aid kit in your trunk, and one at work. I even have one so simple and small, it’s the size of my wallet and fits right into my back pocket. Being a responsible gun owner also means being responsible carrying a trauma pouch wherever I go.